Following up on my previous post about the early Christians in Rome, I wanted to provide some further detail that both demonstrates the level of detail that Peter Lampe was working with, and provides a touching portrait of what life must have been like for Christians in earliest Rome. The following selection describes the Trastevere section of the city; Robert Jewett, in his work on Paul, describes the district briefly: "'Trastevere was the harbor and worker quarter; it contained harbor workers …, laborers in the many warehouses, seamen and brick and tile workers….potters…millers working with imported grain…tanners and leatherworkers.' Roman statistics indicate that Trastevere was the most densely populated section of the city with the highest proportion of high-rise slum dwellings in the city…Trastevere was full of immigrants out of the East and was the site of mystery religion shrines and temples. This section, which lay across the Tiber from the rest of Rome, was left untouched by the Roman fire, which may account in part for the later scapegoating of Christians by Nero." Pre-Pauline Christians are attested for Rome (Romans; Acts 28:15) and Puteoli (Acts 28:13). 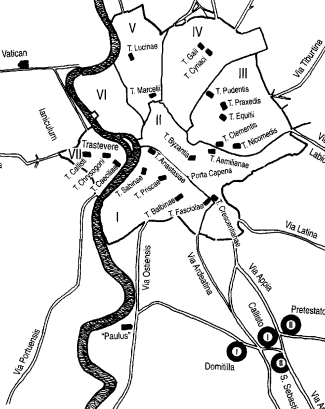 …The Christian presence in Puteoli and Rome correlates with a twofold background. …Christianity spread along the trade routes that Judaism had already followed: the synagogues were the setting for the first Christian mission…The Jewish as well as the Christian “axis” Puteoli-Rome has a particular economic-historical background. The stretch Puteoli-Rome was the main trade route between the East and the city of Rome in the first half of the first century. The road of Judaism and Christianity from the east to Rome followed in the footsteps of trade. Were there tradespersons among the first Christians in Italy? Was the tentmaker Aquila (Acts 18, 1 Cor, Romans 16) from Pontus (see below) representative of the first urban Roman Christians? A fragment of the Severian marble city plan shows a piece of the Via Campana-Portuensis; it is bordered by large warehouses. Trastevere was a harbor quarter, a workers quarter. It accommodated harbor workers, who unloaded the ships’ cargoes, porters of the many warehouses, sailors, and also workers from the brickyards on the Vatican slopes. Many brick-stamps that lie before our feet in the catacombs were pressed in the Vatican brickworks. Shopkeepers and small craftsmen were drawn by the harbor and its imported goods – ivory carvers, cabinet makers, and potters. Millers from Trastevere ground the imported grains unloaded in the harbor. The mills were along the Tiber and on the east slope of the Gianicolo above the trans-Tiber plain, where they were driven by the water of the Aqua Traiana. Trade, industry, transport – the common people of Trastevere lived from them, whether free or slave. … Trastevere was extremely densely populated. In an official inscription of Hadrian from the year 136, there are twenty-two vici listed for Trastavere (Region XIV), while, for other regions (I, X, XII, XIIII), only 9, 6, 12, or 17 vici, respectively, are noted. ["Vici" here are "small city districts." Each was "an administrative unit directed by four vici magistri and four servo public. From Lampe pgs 7, 9-10, 50-51]. I am wondering, for those Roman Catholics who simply assume that there was some kind of "successor of Peter" in Rome, in the form of a monarchical bishop over all the city, much less, over all the world, how many of them were aware of the political structures of the Roman "vici"? Or the network of synagogues, near which the house-church "parishes" emerged? Or that these groups were very far away from each other, because it was a very large city? And the people of these communities weren't mobile, because they were poor? Hey, Mr. Bugay, why don't you stop trying to confuse the matter with all of this factual information? Mr. Bugay, how many copies of his epistle did St. Paul mail? Did he send a copy to each Christian there? I think you are trying to prove too much with this argument. Your conclusion still doesn't follow your premise. We [who worship in our neighbourhood-churches] barely get to see our bishop [who serves in the cathedral], but that doesn't mean he doesn't exist. The existence of parishes does not mean that there's no bishop. Your whole post, and the one before that, is absurd. In your former post you said about people under persecution gathering where they could or where they were able... (during the world-wars, soldiers served the liturgy corn-fields on improvised tables) -- what has this got to do with the existence or non-existence of a bishop? Your last posts are devoid of any sense or logic.. You mentioned there not being any tables used solely as altars: what has this got to do with bishops, AND the same thing happened in prisons or on battle-fields in the 20th century.. so where on earth is your coherence in your thread of thought? :-\ You're NOT making ANY sense..
Don't get me wrong Lvka, I understand why you believe that just because there were a bunch of home churches in Rome doesn't mean that there was also a bishop there as well, but I think you're missing the point (and maybe John Bugay can clerify). From what I've been understanding from these last few posts is that the early church did quite well, even though they were persecuted and even though they were separated from each other even in their own city. Paul didn't even appeal to a Roman bishop (not even Peter was mentioned) when he sent his greetings (Romans 16) but he personally named many people there. Also, this is how the Church STARTED and it did not view traditions of altars or sacrifices necessary to worship the Lord. They may have gotten things wrong even from time to time (I believe that is pretty easy to see in history), but they still gathered together to proclaim the Lord until He comes. We need to understand what Paul says in Romans 16:17-18. Avoid people who put up obstacles and divisions for they serve only themselves. The RCC may claim that it is following Christ, but ultimately it makes the rules itself and you must trust in the RCC just like you would God. I say this with respect, don’t be naïve, just come to Christ through the Gospel which is given to us in His Word. Traditions change, but the Word never does. I thing what JohnB is trying to show is that early Christianity, especially in Rome was not an organised top-down organisation the way Roman Catholics see it. I remember in CCD class being told that the RCC was the same right from the beginning with the Pope at the top, then Bishops, Priests, and deacons, IE that there was no development. BTW this was the same position that Vatican 1 taught INFALLIBLY, and that ANYONE who taught that the Papacy and the whole concept of Bishops as Rome understands that office were historical developments over the course of time that person had "made a shipwreck of their faith and had fallen from the Catholic Church and was no longer "in a State of Grace" IE they were in "Mortal Sin". Based on Vatican 1 INFALLIBLE decrees then most RCC Historians and clergy, INCLUDING Bishops are in Mortal Sin and technically fallen away from the Catholic Faith until they repent and agree, in spite of the facts of History, with Vatican 1 that there was no development and the Catholic Church of the 1st century is the same as it is today in organisational structure. With the first several responses hereon to this thread, I come away with a sense that the raw realities being unfolded are being attacked and that underscores the anachronistic nature of their defense for the RCC being a player at that time in history. They have created an account that if it can be proven false, the whole house is thus proven to be a false nature of Christ. Common sense shows us human nature in the process of developing itself progressively follows similar patterns of growth as this portrait of early Christians in Rome. I like your approach and response there to it and them, zipper and John, the commentor of JB's thread. Neither of you are antagonistic or rude. Thanks for being excellent in your response reflecting the gentle nature of Christ in doing so! So unless all the Catholics of the entire world go to mass at St. Peter's every Sunday, Pope Benedict doesn't exist? This post has to be the dumbest argument against the papacy ever made. And thanks to the Google cache, it will live on the internet forever. More good work…thanks for that. I hadn’t given much thought to the structure of the early church but you have encouraged that pursuit. There’s a Catholic professor at Notre Dame who has written on this and I might add a couple of his points in support of your work. Interestingly, he notes the great diversity of the early church in structure and doctrine. “…by the 50s the Church still had no cultic leaders who were called “priests” even though the Christian communities gathered regularly for liturgy (1 Cor. 14:26).” (Richard McBrien, “The Church: The Evolution of Catholicism”, HarperCollins 2008; p. 43.) So its reasonable to ask how a hierarchy could be built without its first level. “Although there was a serious risk of a leadership gap and a need for stability and guidance, the emergence of the notion of apostolic succession was a far more complex process than traditional, pre-Vatican II Catholic ecclesiology had understood and appreciated.” (ibid, p. 43). Translation: the “infallible” Vatican I was wrong. “The model of the church leader was that of the head of the household, know in Latin as the paterfamilias, a masculine term.” (p. 44). How wonderful the see the work of the Holy Spirit! "This post has to be the dumbest argument against the papacy ever made. And thanks to the Google cache, it will live on the internet forever." Just one more stupid post to the all time moronic argument hit list. Andrew -- I am sorry for the flood of factual information. I just have this sense that some people would just like to think for themselves. Paul Hoffer -- Mr. Bugay, how many copies of his epistle did St. Paul mail? Did he send a copy to each Christian there? I think you are trying to prove too much with this argument. "It is clear that a number of early Christians--particularly the leaders--were very capable readers and writers of texts...Not only are they clearly written by authors who were literate, and written to congregations that were literate enough to have the books publicly read and copied, but they showed a remarkable engagement with earlier written texts, namely the Jewish Scriptures." A number of authors, including David Trobisch and Stanley Porter argue that Paul himself began to collect his own letters during his lifetime. (This is due to the nature of how books came to be written and copied in those days -- there were very exacting requirements for pages, codices, numbers of words that could be put together, etc. As well, Kostenberger/Kruger argue that, given the spread-out nature of a city like Rome, it is likely that there were multiple copies of letters sent to that city, so that it could easily be read to all the churches. We learn more about early publication and circulation practices in the early second-century letter of Polycarp, bishop of Smyrna, to the Philippians to which he attached the collected letters of Ignatius. The historical details surrounding this letter from Polycarp tell us that after Ignatius had written various letters to churches (some of which he wrote from Smyrna), the following occurred within a very short period of time: (1) the Philippians sent a letter to Polycarp asking for a copy of Ignatius's letters, and also sent along another letter for Polycarp to forward onto Antioch, (2) next Polycarp collected the epistles of Ignatius and had them copied; (3)then Polycarp sent a letter back to the Philippians with a copy of Ignatius's letter collection; (4) and finally, at the same time, Polycarp forwarded a letter from the Philippians to Antioch--something he appeared to be doing for many churches. This dizzying amount of literary traffic raises two important points. First, Smyrna appears to have been a veritable "beehive" of activity in regard to letter writing, copying and distribution, showing that it had not only the scribal infrastructure to handle this sort of activity, but an ecclesiastical network between churches that made such activity necessary. Second, given the short timeframe in which Polycarp was able to collect Ignatius's seven letters, it appears this could only have been done if Polycarp already had copies of the letters that Ignatius had sent from Smyrna when the Philippians made their request. This suggests that when Ignatius originally wrote from Smyrna, copies of letters must have been made before they were sent out… (198-199). Lvka -- The key to this is, the "office" of "bishop" as you know it did not exist during New Testament times. Words like elder and presbyter and overseer were used interchangeably, even through and beyond the time of Clement. That's a couple of generations of churches. The fact that Ignatius can talk about the Bishop/Presbyter/Deacon structure doesn't mean that it was in place everywhere -- and some writers have argued that he was trying to persuade people of the validity of that structure. Two other things militate against the notion that there was a bishop in Rome at that time: first of all, the letter of 1 Clement is not from any one person -- it's from "the church which sojourns…." etc. Second, Ignatius, writing to the great city church of Rome, has no individual he can address (whereas, it is always his custom to address the bishops in his other letters). What do those two things tell you? Further, as I've written here earlier, Marcion (144), who was a MAJOR contributor to the church at Rome, had 200,000 cestares returned to him. He did not appear before the bishop; he appeared before a council of elders. And Hermes, at the time, also wrote about the presbyters of the city who fought among themselves as to who was greatest. If there were one person in charge, both of those situations call for a strong leader to be present and take control. And both situations are much more understandable if there is no one in charge. If you think I'm not making any sense, well, then, this is the majority position and understanding among scholars and historians of the period. And so if you think they're not making any sense, well, then, you just go ahead and congratulate yourself on what a smart, clear thinker you are. Hi Zipper, you are precisely correct in noting Paul's caution to those who were "causing divisions" in Romans 16:17-18. As I noted in my response to Lvka, above, there were such divisions in the Roman church. 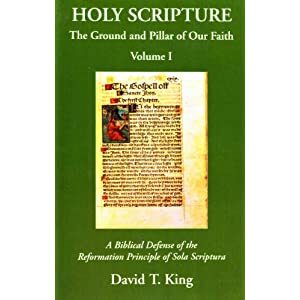 According to Moo in his Romans commentary, "by describing these stumbling blocks as being 'against the teaching that you learned,' Paul makes clear that he is thinking mainly of false doctrine. The seriousness of the threat they pose demands a correspondingly serious response from the Roman Christians: they must "turn away from them"; "shun them". Paul has no sense at all that they are in any way supernaturally protected from error. There is good evidence that 1 Clement was interested in running the churches in a fashion after the Roman military. The problem with this was that there were a lot of different chiefs, and as I said, "they fought among themselves as to who was the greatest." Hey "john" thanks for corroborating what we learned in CCD. That's the kind of thing I tried to emphasize with the Fortescue threads -- Peter was in charge from the beginning, and there was no lag at all in the line of popes. One right after another. Natamllc, welcome again! Yes, anachronism is the story of Roman Catholic apologetics. Constantine -- You know, I just reporting what I've read. I've not read anything from McBrien, but I can imagine, from what you said, that he'd get under some peoples' skins. ...and this group (or synod) of presbyter-bishops in every city had a group-leader, a leading presbyter-bishop. This was not an exception --quite the contrary--: the group of deacons in a city ALSO had a leading deacon (called arch-deacon or proto-deacon) as their head. In the course of time, the two notions [presbyter and bishop] became distinct, but the reality that they expressed was already there from the very beginning. ...which was headed by a leading elder, nowadays called 'bishop'. (The bishop is the head of his local council of presbyters -- that's the definition of the term). I don't believe in the lack of a bishop over the presbyters of Rome for the same reason I do not believe in the lack of epiclesis from the liturgy of Rome: all other liturgies (even from Milan [in Italy], Gaul/France and Spain had an epiclesis) -- it would be question-begging to assume that the one in Rome did not, when ALL others, even the ones in the West, did. The same goes for Rome's bishop: all other cities [and Rome was the capital of the Empire, for PETE's sake ;-) ] had bishops: it would be question-begging to assume an exception in the case of Rome, and Rome ALONE. It's simply absurd. Multiple fallacies at work here as usual. (1) Just because the lexical distinction between bishop and presbyter had not evolved in the NT times does not mean the notion of chief presbyter was not known. (2) If per se the actual office of bishop did not exist in Rome at this time, it does not mean that the apostles did not institute it before they passed on. The apostles were the original overseers of the church. It seems only reasonable they would exercise exclusive executive power in the church's formative stages before eventually passing that power onto the next generation. (3) Just because a church writes a letter jointly from all its presbyters (1 Clement) in no way indicates that there wasn't a chief among them. Question begging of the poorest quality. Neither do councils of presbyters show there wasn't an overseer among them. (4) If Paul's mentioning of divisions in Rome proves no bishop, it would also seem to prove no presbyter(s). Wouldn't the people be correctly following the presbyter of their house group? This claim proves too much. The reason Paul could make this accusation was because all the church in Rome were supposed to be one church, but weren't acting like it sometimes. I don't know what reference to Hermes is, I'd have to see it. (1) Just because the lexical distinction between bishop and presbyter had not evolved in the NT times does not mean the notion of chief presbyter was not known. Doesn't mean it was known, either. We are in the same boat, eh? (2) If per se the actual office of bishop did not exist in Rome at this time, it does not mean that the apostles did not institute it before they passed on. The apostles were the original overseers of the church. It seems only reasonable they would exercise exclusive executive power in the church's formative stages before eventually passing that power onto the next generation. But you can't demonstrate this from Scripture. So what's "reasonable" about it? (3) Just because a church writes a letter jointly from all its presbyters (1 Clement) in no way indicates that there wasn't a chief among them. Question begging of the poorest quality. Neither do councils of presbyters show there wasn't an overseer among them. Why wouldn't the "chief" name himself? And this isn't the only evidence that no one was in charge. See the newer post, "This Bridge Should Be Illuminated" for a discussion of all of the various evidences from the Apostolic Fathers that no one was in charge in Rome. (4) If Paul's mentioning of divisions in Rome proves no bishop, it would also seem to prove no presbyter(s). This is really a stretch of an assumption. You seem to be referring to my comment from Moo's commentary on Romans. That was one small component of everything he said. You are actually long on the pronouncement of "multiple fallacies" but short on actually discussing the issues at hand. Uhm... they served the Eucharist every Sunday. They couldn't have done this without a table (there's your altar). And the bread and wine of the Eucharist are a sacrifice, since --although they literally "grow on trees" (grains and grapevines)-- those "trees" belong to someone, and that certain someone offered them up to God instead of keeping them all to himself: -- hence `sacrifice`. There is no evidence in the New Testament that the Lord's Supper was viewed as a sacrifice. And your assertion that "someone offered them up to God" is the kind of "sacrifice" that is now spoken of in Roman Catholic (or even Orthodox) doctrine is very much a stretch. You are reaching for something that's just not there. Lvka, the "eucharist" wasn't the same thing back then that it is today. Eucharist is simply a Greek word meaning "thanksgiving" and the early Christians simply gave a sacrifice of thanksgiving. They were not offering God bread and wine as a sacrifice, they were simply remembering the Lord until He comes again. The Lord's supper isn't about Jesus coming back down from Heaven again and again, it's about remembering His work on Earth and praising Him for His sacrifice. In fact, the early Christians may have even misunderstood that because it was not at all ceremonial like it today (in RC or protestant churches). Look at the way the church in Corinth was handling the Lord’s Supper in 1 Cor 11:17-22. It appears that it was quite literally a supper, not just a wafer and a drop of wine. Besides that, when you start placing God on these manmade objects and begin to worship them as if they are Jesus Himself, the message is lost. The message is not ‘Thank God for we have the Lord’s Supper!’ No. The message is ‘Thank God for giving us His Son to die on the cross in our place!’ Jesus paid the price for our ransom, and that is what we are to praise God for and give Him thanksgiving for. Something offered up to God is a sacrifice: that's the word's definition. There's really nothing much to add or comment there. I also don't understand why you would think that I have a problem with Zwingli & modern Evangelicals from THIS point of view. (The problem lies somewhere else). 1 Cor 11 does not equate the Lord's supper with a sacrifice. It does not even mention it. So you are floundering in the wind again to make a connection where none exists. Again, you are leaping from grains and grapevines to something resembling the Jewish notion of animal sacrifice. It just wasn't there. Until much later. The odd thing, to me, that is, with the last several exchanges is there apparently is something missed or overlooked here. Consider what is existentially going on there at that "table", historically and ask yourself if that might be what is going on here? First, to zipper's point there about thanksgiving: In fact, the early Christians may have even misunderstood that because it was not at all ceremonial like it is today (in RC or protestant churches). I would say, now seeing and understanding just what the RCC has become, evolving into after so many years of time, there clearly can be a legitimate charge put out against her that she has missed the point of what was actually going on there at dinner with Jesus/God cited above from Luke's Gospel? The point about the "first" cup of thanksgiving seems to be "being overlooked", does it not? Then, the betrayal. What happens withing their group then? Just as they "misunderstood" the "party" Jesus was opening them up too through His impending betrayal into the sufferings, death, burial and resurrection, it seems now too it is being missed again hereon, don't you think? Instead of understand it, they missed it! Do we miss it now? They ended up arguing as to who would be the "greatest" among them? Why? Maybe to justify why they are not the one that Jesus was talking about betraying Him? Hmmmmmm? Is that not your argument here, Lvka? Jesus, besides the preparation He was going through, had to then digress to their level of stupidity, once again, so as to raise their eyes to the objective of the Gospel of the Kingdom, not to evolve into something not intended by Christ, as the RCC has certainly done, becoming what she is today? There is not, as far as I can see that sacrifice of servanthood on a level of existential dirt under the fingertips in these days, a laying down one's life for the edification of the Body within her, and which, there seems, is no similitude of servanthood found at all today in the RCC, and I dare say, now across the world in many fundamental, evangelical, frontline missionary Church organizations, too, who are all vying for top billing among themselves in their works of goodness for the Lord these days! Is there no sense here? Is there no true existential gut wrenching reality here of the cost of Life with Christ being paid while sojourning on the planet until the day we too pass to the other side? I dare say, if there is, it's dim in appearance these days? I also can't picture the priests holding the bread and chalice in their hands during the whole service... not using any table whatsoever... it's simply absurd. ...then say so! ...Don't say that they didn't use tables! "no specific furniture [like, uhm, a specific table to be used ONLY for the service of the Eucharist in the private house in which they gathered], ergo no altars". No, but now that you've mentioned it, 1 Cor 10 seems to do just that.